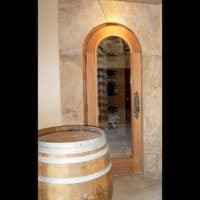 A wine cellar door is the first thing you see before you get to the good stuff. 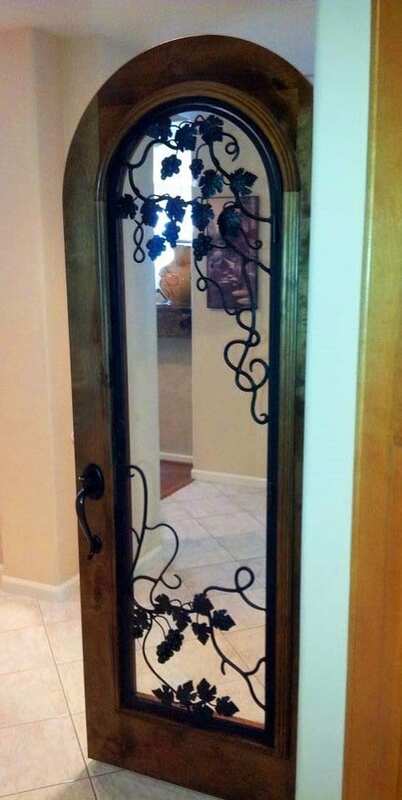 The quality of a door gives you a preview of what to expect from the storage facility. 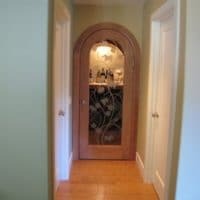 Ideally, the door’s design represents the overall style of the wine room. 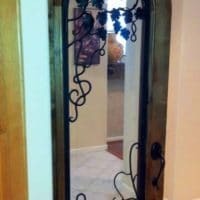 The quality of the entryway, also determines whether the wines inside are resting in the right storage conditions or not. 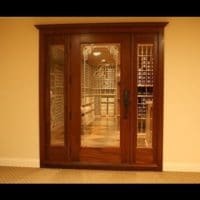 Custom Wine Cellars Los Angeles builds doors that can are sure to keep your wine room sealed and insulated, while meeting your aesthetic requirements. 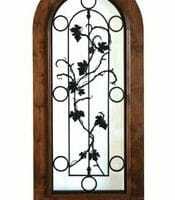 Increase the aesthetic value of your wine cellar. 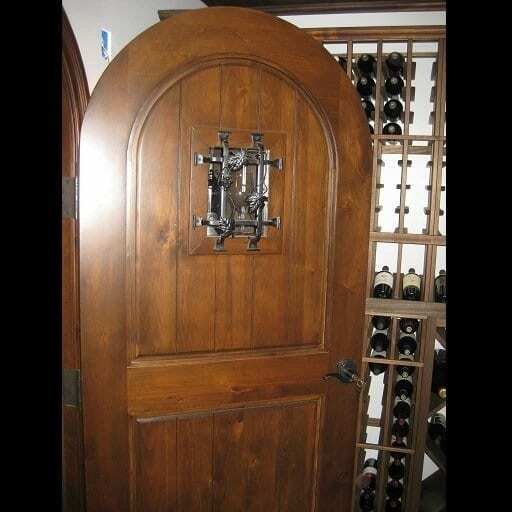 Keep the wine cellar tightly sealed to prevent fluctuations in temperature and humidity. 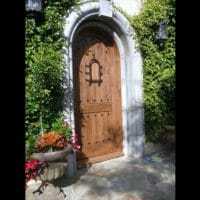 We, at Custom Wine Cellars Los Angeles, make sure that the doors we build always fulfill these two purposes. 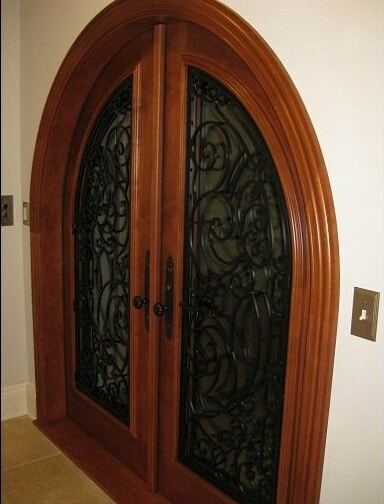 There are various kinds of doors for wine cellars. Regardless the type, they have to serve their two purposes. They have to be functional and aesthetically pleasing. 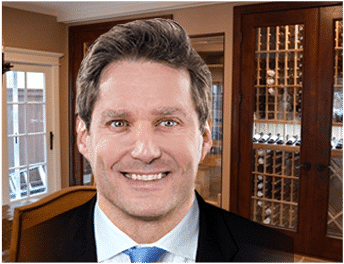 Regarding aesthetics, choose a door that best represents your personality and matches the overall style of your wine cellar. 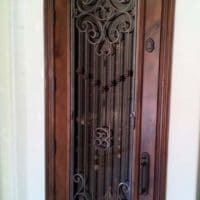 You can choose to have your door built with either one or a combination of the following materials: wood, glass, and wrought iron. 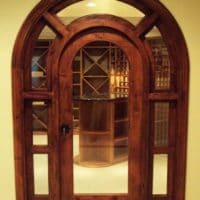 Our expert builders utilize both classic and modern techniques in building wooden wine cellar doors. The Mortise & Tenon method is the oldest technique used by builders to join pieces of wood. This method continues today because it is simple yet superiorly strong. As for modern methods, our team uses Laminated Veneer Lumber (LVL) for the core of our doors. LVL is made of multiple layers of thin wood that have been combined using a sturdy adhesive. The composite nature of LVL makes it highly resistant to warping and shrinking. LVL is also known for its higher insulating qualities compared to other wood products. On top of the core LVL, we attach a thick layer of solid wood, so that we could achieve that natural appeal of solid hard wood doors. 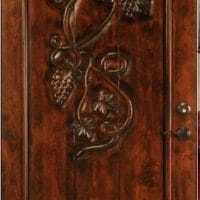 There are various wood species available on the market that can be used in building wooden wine cellar doors. 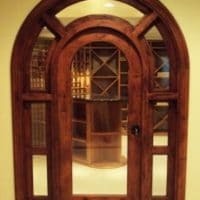 We, at Custom Wine Cellars Los Angeles, offer doors made from either Redwood, Mahogany, or Pine. Redwood is available in two varieties: All Heart Redwood and Premium or Clear Redwood. All Heart Redwood has darker and more consistent colors, while Premium or Clear Redwood has more variations in color. 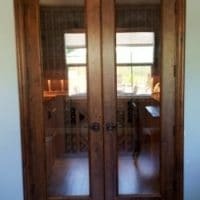 Premium or Clear Redwood is the less expensive type. 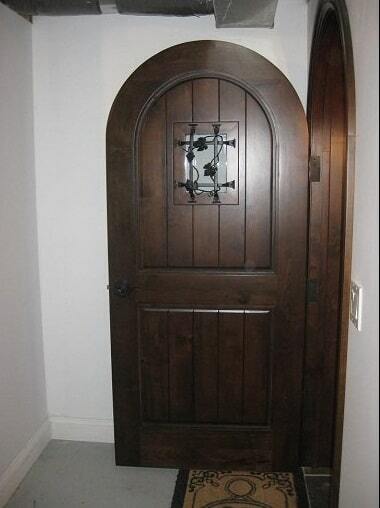 Wine cellar door builders in Los Angeles strongly advise against applying any stain or finish on Redwood. This type of wood species does not stain well due to the amount of oil present in the wood. 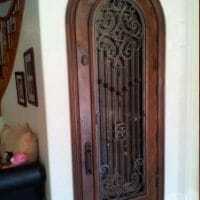 However, our experts assure clients that even without any finish or stain applied, the door will still look amazing. Redwood is known for its natural earth tone colors that develop beautifully as the wood ages. 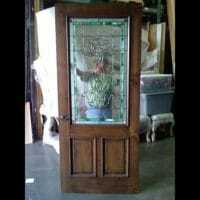 There are many varieties of Mahogany, and these include Genuine, African, and Malaysian. 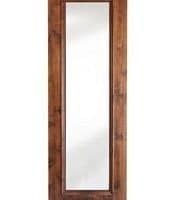 Malaysian Mahogany is the most popular choice. 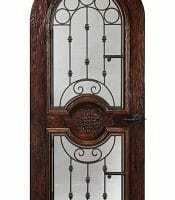 Mahogany is known for its durability and non-aromatic qualities. This wood species is a popular choice also because of its gorgeous natural color schemes that can be further enhanced with the right finishes. Among the three wood species, Pine is the most affordable. Although it is less costly, this material offers high-quality aesthetics. 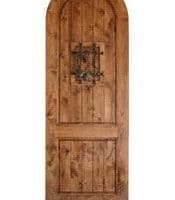 In fact, this wood species is the popular choice among those who want a rustic-style wine cellar. Pine is perfect for those who want to achieve a warm and country-style feel. This wood species is also moderately soft and light in weight. 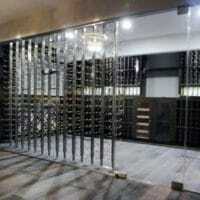 Glass is commonly used for contemporary and modern style wine cellars. However, this material is timeless. 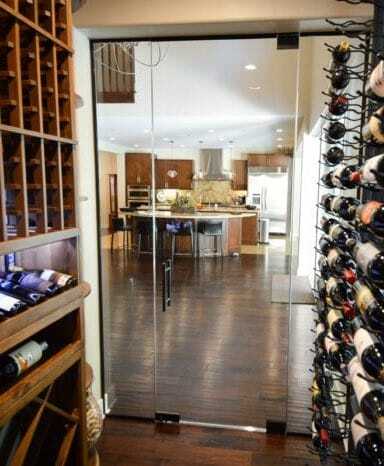 Meaning, glass doors can be installed in traditional style wine storage structures. 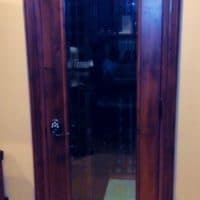 Our builders only use ½” thick dual pane glass, in order to prevent condensation from forming around the door and on the glass. Dual pane glass is built by combining two panes of glass together, while leaving a thin space in between the panes. This space that it sealed in between the glass panes is the key to preventing the formation of condensation. 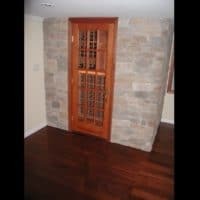 We only use insulated glass doors for custom wine cellar because this material emits minimal heat. 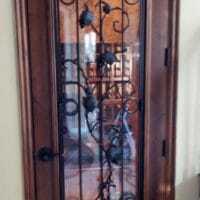 The heat transferred through the glass panes from outside the wine room is reduced. 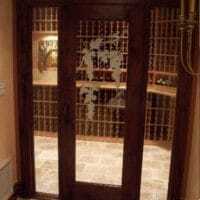 Insulated glass doors also protect the wines in the cellar from exposure to Ultraviolet rays. UV rays can damage wines. 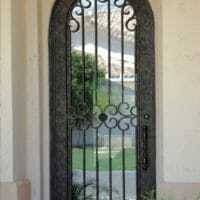 Wrought iron is a popular request among clients, and is usually combined with either glass, wood, or both. 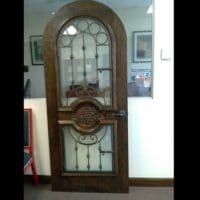 Our team of expert wine cellar door builders offers hand-forged wrought iron doors that are custom-built to meet the design requests of each client. We use a combination of 16 and 18-gauge wrought iron bars in building these doors. 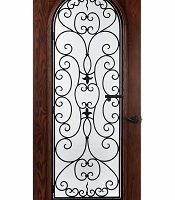 The wrought iron is custom-designed to have intricate patterns and details that add character to any wine cellar. 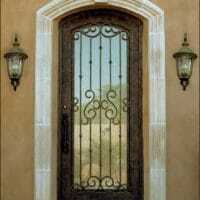 The most popular designs in Los Angeles are the Barolo style and Tuscan style wrought iron wine cellar doors. 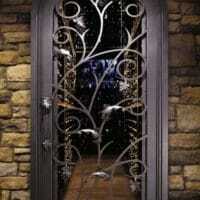 We take pride in building high-quality, dependable, and aesthetically superior wine cellar doors. 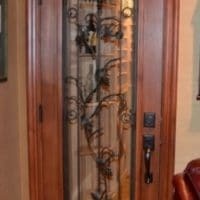 You can choose from a variety of our existing designs or we can custom-design a door unique to your wine cellar. For more information about our services, contact us today by clicking here!